It’s not writer/director Wes Anderson’s fault that since he burst on the scene with what is still his best film, Bottle Rocket, he has become a hipster demigod. Even when The Royal Tenenbaums hit, tattoo mustaches on fingers and scarves in the summer were but a glimmer in the eyes of youth who would go on to appropriate the word irony in a way that is ironically ironic. Throw a pebble at an Arcade Fire concert and you’ll hit someone who vehemently believes Anderson is genius. So at the risk of being choked to death with a keffiyeh, let it be said: he isn’t, and Moonrise Kingdom isn’t the best movie of the year either (it isn’t even the best movie in the last 2 weeks). Stop me if you’ve heard this one before, but Anderson’s latest features Bill Murray and a bunch of other actors delivering exhausting, monotone, deadpan performances while dressed in colorful kitsch and dealing with dysfunctional love. The film takes place in 1965 on an island where Scout Master Ward (Edward Norton) and his “Khaki Scout” troop are camping. When young Sam (Jared Gilman) goes missing, Ward calls the clueless island cop Captain Sharp (Bruce Willis) for help. Turns out, Sam has run away with Suzy (Kara Hayward), an island resident prone to depression and violent outbursts. Her folks, Walt (Murray) and Laura (Frances McDormand) haven’t done her any favors with their parenting skills, so Suzy seeks prepubescent love with the only boy to ever see through her broken façade. The remainder of the film is packed with narrow escapes, boys struck by lightning or stabbed in the kidney with scissors and, because it’s Anderson, Jason Schwartzman. Honestly, there is something sweetly dreamy about the film. The air of addled fantasy that blows through gives Sam and Suzy’s romance a feel something like a fairy tale shot on Instagram. Likewise, watching the Khaki Scouts repeatedly unleash hell is delightful, even if it calls back to the superior Rushmore. But something’s wrong. Anderson’s characters are increasingly unrelatable, his stilted and stylized line delivery works in opposition to the gentle, potentially charismatic young love story and the whole thing more or less wears you down into mild appreciation. Anderson is in trouble, folks. There’s another director who has a slavish dedication to a core group of actors, who repeats the same visual and costumed style, who hammers on the same themes relentlessly and who is followed by a cult who will face-stab you for questioning their God. That’s right: Anderson is dangerously close to going “full (Tim) Burton.” While the auteur is not there yet, he’s inching ever closer to that abyss. The main argument offered in Anderson’s defense is that there’s “nothing wrong with having a particular style.” It’s true, there isn’t. But carbon copying one’s own body of work in perpetuity makes one a novelty act, even with a loyal fan base. 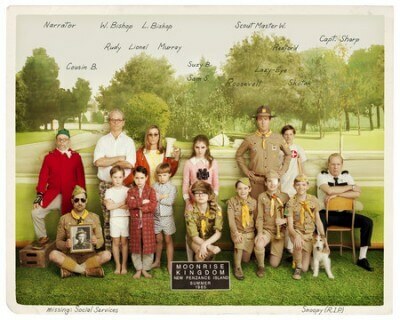 Peppered with gorgeous sequences and infused with some clever moments, Moonrise Kingdom squeaks by…barely. But, Mr. Anderson, you are on notice: move on or fade away.